Scott, Kiara Spencer, Emily Verma, Manaas. The Dakota Access Pipeline (commonly referred to as DAPL) runs for 1,172 miles, starting in the Bakken and Three Forks Formations and continuing Southeast through South Dakota and Iowa, ending in the Gulf Coast Refineries in Pakota, Illinois. The Bakken and Three Forks Formations, the point where Saskatchewan, Manitoba, North Dakota and Montana meet, have an estimated 7.4 billion barrels of oil and 0.53 billion barrels of natural gas trapped underground. 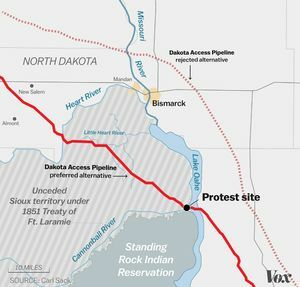 In addition to crossing over four state borders, the proposed pipeline route will cross under the Missouri and Mississippi Rivers as well as a section of Lake Oahe, located half a mile from the Standing Rock Sioux Reservation border. Plans for the pipeline were first announced on June 25, 2014 by Energy Transfer Partners (ETP) after they claimed there were enough shippers interested in committing to the project . After overwhelming public outcry, especially from the voices of the Standing Rock Sioux Tribes, then-President Barack Obama halted further action on the plans due to fears the project would affect US efforts to achieve a global climate change deal, a forefront of his administration, and initiated an environmental impact assessment, a process which could have pushed construction back several years. Although DAPL needs government approval as the planned route passes through the country’s Northern border, the final decision is made by the U.S. Army Corps of Engineers and not by an executive order. In January 2016, after months of public hearings regarding the proposed route, the Public Safety Commission unanimously approved the plans, with construction beginning on six oil terminals in North Dakota just days after. ETP then declared that construction on the pipeline were scheduled to begin in mid-May. On January 24, 2017, newly elected President Trump moved to advance the construction of the pipeline. Trump, who once owned between US$15,000 and US$50,000 of ETP’s stock in the months before being elected into office, has shown his full support for efforts which bring more fossil fuels into the US as it stands as a step towards complete independence from foreign imports. Despite all efforts to reject further construction on the pipeline, on February 8, Trump issued an order directing the Army Corps to take all necessary steps to ensure the completion and full operation of the North Dakota Access Pipeline. In March 2017, the federal court denied the Standing Rock and Sioux Tribes their wish to prevent the activation of a newly completed section of the pipeline, therefore giving the project its final green light. The Standing Rock Sioux Tribe have cited the Treaty of Fort Laramie as proof the land ETP plans on building on is rightfully theirs. The Treaty, signed in 1851 between the federal government and the Great Sioux Nation of Lakotas, Dakotas and Nakotas, defined the boundaries of the tribal lands in an attempt to limit intertribal land disputes. One of the terms of the treaty declared that the U.S. Government would protect the Sioux Nation from U.S. citizens so as to promote and keep the peace between both sides. 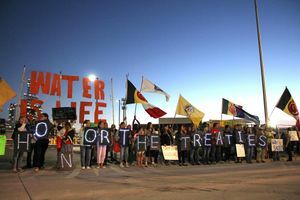 Furthermore, many have called out ETP as denying the Sioux Peoples their basic human rights of access to clean water as well as the Indigenous rights they hold in practicing their cultural traditions. The pipeline would put 28 tribes at risk from contaminated drinking water, which ultimately affects millions of people. Energy Transfer Partners claim that the pipeline will transport 470,000 barrels of crude oil every day, create between 8,000 and 12,000 local construction jobs and bring $156 million in sales and income taxes into the US economy. Bakken Holdings Company, LLC holds 75 percent interest in Dakota Access, LLC, the developers of DAPL, and 75 perfect interest in Energy Transfer Crude Oil Company, the developers of the Energy Crude Oil Pipeline Project (ETCOP). ETP is the primary manager of the project planning and building of the DAPL and ETCOP, while SXL will be the operator of the pipelines. As SXL owns 40 percent of Bakken Holdings, ETP owns the outstanding 60 percent. North Dakota Petroleum Council (NDOIL) is the trade association that represents over 500 companies involved in the oil and gas industry, where in the year 2012, 98 percent of the 243 million barrels in North Dakota were produced. According to the actors in favor of DAPL, the pipeline is claimed to be in the best interest of the environment, as it is the most efficient and environmentally aware method of transporting crude oil. As the nearest land alternative has historically been transportation by railway or truck, which has been the culprit of numerous disastrous human and environmental casualties, this scientifically advanced and vigilantly engineered product will exhibit various benefits for many aspects of the environment and the economy. The Dakota Access’s defense claims the pipeline’s technologically advanced model is the safest ever built and passes all federal safety requirements which present no threats to the Standing Rock reservation, their water supply or their cultural sites. The proponents of DAPL belittle the activists and environmentalists in opposition to the pipeline as extremists that have a simple agenda without thought our reason or comprehensive understanding. The Dakota Access deems the environmentalists who protest DAPL extremist outsiders with an agenda that is merely in opposition to all fossil fuels, which is ironically what they regard a pipedream. Congress legislated the National Historic Preservation Act (NHPA) of 1996 to “foster conditions under which our modern society and our historic property can exist in productive harmony.” A case was made to the United States District Court for the District of Columbia to contest that the U.S. Army Corps of Engineers (the Corps) violated the NHPA. The defendant’s case states they engaged in extensive consultations with numerous tribes, noting of 389 tribal meetings, including site visits in which many were accompanied by the Commanding Officer of the Omaha District. The Plaintiff’s case argues the overall quality and quantity of the meetings were not in a “reasonable and good faith manner.” The verdict from the Court could not come to a consensus on the Plaintiff’s claims as the Corps showed evidence of compliance with the NHPA, while the Tribe could not show enough evidence it will suffer injury. A main argument from the proponent side is for the economic benefits that will be reaped by the greater population which will positively affect the entire country's economic growth and independence. However, the fact that is often overlooked or withheld is the immense disparity in costs to use transport methods such as trains and trucks instead of by pipeline. The difference is so huge that without the pipeline capacity, railways and trucks would render much too expensive to be a viable option as it would transcend the economic effect of jobs in all directions. The environmental implications for increasing the pipeline capacity have prevailing and influential effects that will lead to a more impactful, binding cycle that will intensify at the cost of the global environment. The increasing pipeline capacity will undoubtedly lead to more oil production, which will ultimately increase the United States' energy independence and their carbon emissions drastically. In response to the construction of the pipeline, the Sioux people have engaged in protests and litigation in attempts to temporarily halt, and eventually stop pipeline construction . Protestors have set up teepees and tent camps for nearly a year. When the Army Corps of Engineers, the managers of the land, ordered everyone at the camps to leave, federal authorities cleared protest camps, searching tents and arrested those who refused to leave. Since the beginning of the protests against the pipeline construction there have been constant clashes between the Sioux people and the police, resulting in more than 625 arrests . Police have many times been accused by protestors of using unnecessarily rough treatment, sometimes involving pepper spray, rubber bullets, and concussion cannons . In July, the Sioux tribe issued a lawsuit against the Army Corps of Engineers, the group that approved the pipeline, claiming that further construction would destroy sacred burial grounds and that if the pipeline were to leak or burst it would contaminate the tribe’s drinking water supply . The court ruled in favor of the Army Corps of Engineers, claiming that they had properly followed federal law throughout the process . However, despite numerous setbacks protestors continue in their acts of civil disobedience to stand against the construction of the Dakota Access Pipeline. Near the end of his term, President Obama declared that the government would voluntarily halt construction of the pipeline and conduct an Environmental Impact Statement to review the potential environmental hazards that the pipeline would impose . This decision came shortly after the lawsuit issued by the Sioux tribe was discarded by the court. With nearly 70 per cent of the 1,172 mile pipeline complete, this decision was not well received by all actors . Many claim that Obama's decision had no legal backing and promised that when Trump got into office this decision would be reversed . The Obama administration made this decision based on the notion that the best thing to do is to consider alternate routes for the pipeline to cross the water supply . On January 24, 2017, immediately following his appointment as President of the United States, Donald Trump reversed Obama's decision to halt the Dakota Access pipeline. His executive order to allow the construction of the pipeline to continue followed promises made during his campaign, however, the Standing Rock Sioux Tribe chairman, Dave Archambault II, stated that Trump's decision goes against his legal obligation to honor their treaty rights . Supporters of Trump's decision claim that the jobs and the economic gains that the country will receive from the pipeline overpower the possible negative environmental and cultural impacts . The decision to proceed with the pipeline means that the Environmental Impact Statement to assess the potential damages that could be caused by the pipeline is may no longer be conducted. This is in violation of the law and may lead the Sioux Tribe members to take further legal action . Although Trump's executive order ultimately approved the completion of the project, there are many caveats that need to be complied with during the completion of the projects . In 2016, the Obama administration proposed a re-route of the pipeline. Although the rerouting of the pipeline was considered to be the best alternative at the time, tribal leaders remained concerned that the decision to reroute was at risk of being reverted as a result of the incoming Trump administration.. Within days of being elected into Office, Trump signed an executive order calling for the advancement on the construction of both the Dakota Access Pipeline as well as other similar projects which had been blocked by the Obama administration. After international backlash following the announcement, Trump issued an argument which stated the projects will provide approximately 28,000 jobs in the United States. He further mentioned that he is willing to re-negotiate a selection of the terms if necessary. A key issue centring around the project concerns the origins of the materials used in construction. Trump was explicit in stating that the pipelines themselves were to be manufactured in the U.S. so as to provide further jobs for the American people.. During a press release, White House Press Secretary Sean Spicer clarified that the Executive memo "directs agencies to expedite reviews and approvals for the remaining portions of this pipeline".. The plans to re-route DAPL have proven to be a source of great stress and concern for both parties. In order for the plans to proceed peacefully, the pipeline will have to be rerouted so as to appease the people of the Standing Rock Sioux Nation and leave both the people and their surrounding environment, such as sacred sites, undisturbed. Regarding the plans' budget, the project is already amounting to US$3.8 billion and any plans to re-route it will increase the cost by an estimated US$1 billion. This provides further reason as to why Energy Transfer Partners oppose any plans to reroute. This project is an ongoing issue that will continue to ensue without further remedial action and support from the opposing actors. The project is presently set to continue, in early 2017 the Standing Rock Sioux water inlet will be displaced to a different location so that the pipeline can take presence. Senators are in the course to inquire for the approval process, and construction companies are mobilizing to complete the remainder of the project. Traction for the opposition of DAPL has not gained as much attention in the last few weeks, despite its agenda to be completed shortly in this year. The support for the project to proceed is strong with the support of the federal judge for the District of Columbia, the Army Corps of Engineers, and the White House with the current President Donald Trump and his cabinet. Energy Transfer Partners and Dakota Access is anticipating the shipping transport of crude oils from Bakken to Illinois. On behalf of the local indigenous tribes, environmentalists and activists are desperately needed to halt the further progress of the Dakota Access Pipeline Project.